Nintendo has revealed that its high definition remake of The Legend of Zelda: The Wind Waker is coming to stores at the beginning of October. 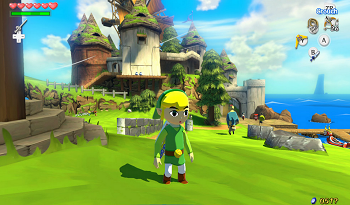 Earlier this year Nintendo announced that it was working on a high definition remake of The Legend of Zelda: The Wind Waker. This excited the game's many fans who enjoyed the original game on the Gamecube and were looking forward to the upgrades Nintendo would make to enhance its experience. Initially, the game was slated for a Fall release window. Now, with autumn creeping closer, Nintendo has finally provided a specific release date. Wind Waker HD will be landing on store shelves October 8th. The release can perhaps be seen as the opening shot of a push by Nintendo to make the Wii U a more attractive prospect for consumers who have responded tepidly to the console up to this point. The company has expressed hopes in the past that, with games like Wind Waker HD, Donkey Kong Country: Tropical Freeze and Super Mario 3D World coming out in relatively short succession, it will see a boost to the console's sales. That being the case, we can't help but wonder if outside factors, namely the impending launch of the PlayStation 4 and Xbox One, could perhaps derail some of those plans. While an injection of the company's tried and true franchises has, in the past, been a recipe for success, the eyes of many gamers are arguably turned toward the new consoles. Granted, the family friendly fair that Nintendo deals in might draw in a different audience than Sony and Microsoft's arguably more adult-centric lineups, but it's still possible that some gamers could be too wrapped up in their shiny new consoles to pay much notice to the latest iterations of Nintendo's long running franchises. Woo! It comes out on my birthday! Too bad I won't have the money for it....or the money for the WiiU but...woo? Seriously though, this is cool though. I've wanted to play more Zelda games so, if I get the chance I'll get this one. Though I do wonder how well it'll do with the new consoles releasing just around the corner and people wanting to save their money for games on them...only time will tell I guess. I played this game at Gamescom and it looked amazing - played the first boss,that giant bird and it was really good. However I'm doubtful that this game and the other 2 mentioned will increase Wii U sales. So far i muust admit that iÂ´m more tempted to buy a WiiU than i am a PS4, thereÂ´s quite a few games i would like to play on the way, but iÂ´m probably not rushing out to buy one any time soon. I prefer to wait until there are plenty of cheap games out there. Huh, it's being released in Europe first (on October 4th), like The Wonderful 101?